by Granger E. Westberg, Jill Westberg McNamara. Augsburg Books, 1990. Care for the whole person- body, mind, and spirit - is part of the church’s mission. 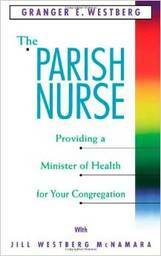 This classic book is written for congregations and individuals who want to provide a wholistic health ministry for their faith community, incorporating a parish nurse as the primary minister of health. “Parish nurses serve as health educators and advocates, health counselors, volunteer trainers, and support group organizers” as volunteers or staff members. This book grew out of testing the parish nurse model in all kinds of churches and many different situations throughout the United States. The project, begun in 1983, has been the foundation of parish nursing and health ministries in congregations since that time. Granger Westberg, a pioneer in wholistic health care and the interrelationship of religion and medicine, was professor in medicine and religion at the University of Chicago and professor of preventative medicine at the University of Illinois College of Medicine.